Only 32 feet. Huge Driver side full body slide!! Also passenger side slide out. A total of two slides with the equivalent of being 4 normal sized slides in square footage 2011 ITASCA SUNCRUISER 32H Pre-owned with Full body paint. Call or text Clayton 801-910-7760 for questions and Spring Special Pricing and I pay your dealer fees. Buy this week and get a warranty included. I have 25 years experience repairing RVs. I'm not pushy and I would love to help answer any questions. Garage kept beautiful condition. Interior looks new, exterior looks new. Paint still shines and looks amazing. Both the prior owner and I are perfectionists, everything is nice, everything is clean. Runs great. Everything works. The interior still looks new. Look at other ones first you will see the difference. #3 Hate dealer fees? Unlike other dealers, $299 is the ONLY cost. Mention this ad and I will personally pay it for you. All designs are painted, NOT decals so they won’t fade or peel. Very nice 32 ft Class A motorhome with fiberglass exterior gel coat finish. Driver side door for convenience. 22.5 inch aluminum wheels, Huge side by side 4 door fridge freezer combo 3-way operating. Corian counters. Beautiful wood cabinetry. 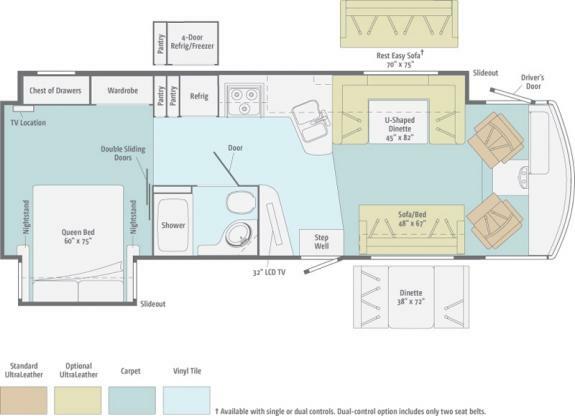 Lots of closet and storage space, Two central air conditioning units and electric heat option. Satellite, fan in bedroom upgraded ideal rest Comfort Control mattress. Outside entertainment with stereo system and DVD player. Two flat screen TVs one inside and one outside the RV. Backup camera side view cameras, and automatic leveling system. Front driver and passenger power shade and visors day and night shades on all other windows. There has not been any smoking, pets or water damage to this unit. ENTIRE MOTORHOME JUST PASSED OVER 100 POINT INSPECTION! 53000 original miles on Ford Triton V10 engine. Nice unit too many options to list won't last long at this price.